Peter Fleming was at the top of Scottish marathon running for 17 years and for most of them he was top ranked Scot in the distance and at times holding the top two, three or four times in the same year. For example look at his record in the 1995 in the table below where he had three times of 2:16 or better. Like most of the top runners of his generation he travelled far and wide in search of competition and times but eventually he did most of his running in America and he is currently settled in Boulder, Colorado. To begin with he was one of a very good group of young endurance runners from Bellahouston who all went on to become first class marathon runners – Andy Daly, Graham Getty, George Braidwood and Peter all ran sub 2:20 for the marathon and had good careers as cross country runners as well. Peter however has clearly been the best in terms of times run and victories all over the world in many classic marathon races. He became a specialist marathon runner and he must be regarded as one of the most consistent of the top marathon men of the twentieth century. Before looking at his progression let’s start with a young (22 year old) Peter Fleming answering the SMC Questionnaire in May 1983. How did you get involved in the sport initially? When I was about 10 years old my father made me run 100 metres which I did in about 16 seconds. He told me that men could run 6 seconds faster and ever since I have tried to run as fast as possible over every distance I attempt. Has any individual or group had a marked effect on either you attitude to the sport or your performance? Yes, myself. Being able to discuss within myself (as I am self coached) my training schedules and racing performances in a critical way and in a way in which I can bring about peak performances for certain races that I feel are important. What exactly do you get out of the sport? The feeling of euphoria and speed after a good training session or race and the overall feeling of fitness and health. Can you describe your general attitude to the sport? To get as much out of athletics as I possibly can and while I can. What do you consider your best ever performance? 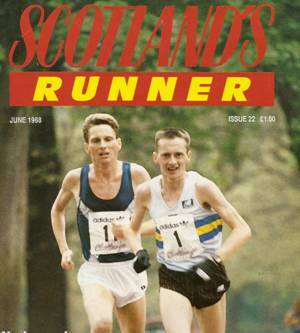 The 1982 Glasgow Marathon where I reduced my personal best from 2:17:21 to 2:19:40. And your worst? The 1982 Glasgow Marathon for not winning it. What do you do apart from running to relax? Sleep. What goals do you have that are still unachieved? To receive an international vest and to go under 2:15 for the marathon. What has running brought you that you would not have wanted to miss? Self confidence. teatime 2.5 mile run home from college. Total Week’s Mileage: 99 – 100 All on grass except Sunday. So where did this confident young man go from there? Was his confidence misplaced? Was his estimate of his ability totally wrong? The figures show that he was spot on in fact. In 1995, maybe his best year, he had the top three marathon times by a Scot and topped the half marathon list as well as the 10,000 metres on the road. So how did he get from being a promising young runner to the top Scottish road runner for six years in succession? His annual progression might be interesting in this respect. 5000 Track 13:51.2 2 times. So no marathons? His best single year in my opinion was 1995. In January he ran the marathon in Houston in 2:13:35 (5th), on 9th April he ran 10 miles on the road in Washington in 47:38 (9th), on 20th April he ran the half marathon in Philadelphia in 64:13, in May it was the Pittsburgh marathon in 2:16:00 (5th), in August he was back in Glasgow where he was 13th in the half marathon in 64:32 and in October he was timed at 2:15:25 for the marathon in Chicago. 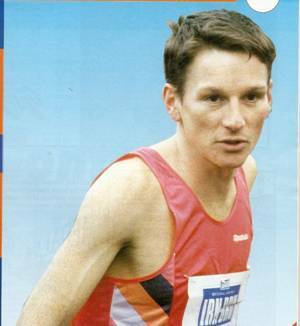 GB marathon ranking positions for his best run each year were 7th in 1993, 8th in 1994, 6th in 1995 and 9th in 1996. His personal best of 2:13:33 in 1993 ranked him in the top 170 in the world for that year (including Africans). The rankings below are for Scottish lists only. After this period and settling in the States he did not stop running or running well. Without attempting to give total coverage of his running since 1998, the following races are noted: 1999: Austin, Texas 2:17:14 first veteran ; Also in 1999 – New York 2nd in class; 2002 – Motorola Marathon, Austin, Texas 2:23:48 first veteran (aged 41); 2003 – Motorola Marathon, Austin, 2:23:20 first veteran (42); 2004 Vermont City Marathon 1st 2:24:02. Note that the 2004 time is 5:30 a mile pace. These were just picked from the internet but it is clear that Peter is still running and he must be enjoying it or he wouldn’t do the training to turn in these performances. As Scotland’s first real professional marathon runner with more really top class times (ie sub 2:20) to his credit than most it is unfortunate that he never competed in any major Games – Commonwealth, European, Olympics and World Championships all eluded him – and that may be the price that the top men and women have to pay nowadays but I can’t help regretting that his name does not appear even once on the list of Scottish Marathon Champions.